When it comes time to purchase new fire extinguishers for your home or business, it may get confusing reading the labels. Here’s what to look out for! When it comes time to purchase new fire extinguishers for your home or business, it may get confusing when it comes to reading and understanding the different letter and numbers on the label. 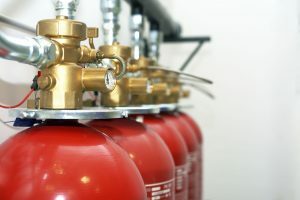 Ensuring that you buy the correct size and type is imperative so here’s what to be on the lookout for when you are looking at a fire extinguisher. The letter on the fire extinguisher indicates the classification. Class A: This puts out ordinary combustible fires like paper, plastic, wood, etc. Class B: This put out flammable liquid fires like gas, petroleum, oil, etc. Class C: This is used to put out electrical fires. Class D: This classification puts out metal fires caused by magnesium, titanium, sodium, potassium, etc. Class K: This will put out cooking fires caused by flammable oil and grease. ABC fire extinguishers are designed to put out class A, B, and C fires since all of them can be found in conventional homes and businesses. It’s also important to ensure that your fire extinguishers are always kept in condition. The Class A size rating represents the water equivalency in the fire extinguisher. Each number represents 1 1/4 gallons of water. So in the case of the above example, 4A would be equivalent to five gallons of water. The more water you have, the better your chances of extinguishing a fire, at least in certain cases. The Class B size rating represents the square footage the fire extinguisher can cover. So in the case of the above, 20B means the extinguisher can provide 20 square feet of coverage. This, of course, is subject to the person wielding the extinguisher doing it properly by sweeping the nozzle from side to side rather than aiming in one direction. Class C has no size rating due to Class A and B extinguishers are able to handle electrical fires. To fight Class C fires, choose your extinguisher based on Class A and Class B ratings. Judd Fire Protection, LLC has your back -in your home and in your business. With over two decades of experience in design, installation, service and inspection of residential and commercial fire protection systems, you can trust Judd Fire Protection. We service clients throughout the Maryland, Pennsylvania, Washington D.C., Virginia, and West Virginia. If you are interested in finding out more about our services and protecting your home or business, give us a call at 410-871-3480 or contact us online. For more fire safety tips, follow us on Facebook, Twitter, and Pinterest. This entry was posted on Friday, June 30th, 2017 at 9:18 am. Both comments and pings are currently closed.